Ask your parents how they met. If you haven't heard it already, you will likely hear a treasured story about an event which may have seemed quite ordinary at the time. Maybe the meeting was a function of sharing the same part of the alphabet and therefore being seated next to each other in math class. Hindsight reveals a seemingly trivial encounter to have been momentous—momentous for your parents (whose lives might otherwise have gone separate ways) but even more momentous for you (without that meeting, you would likely not have come into existence). 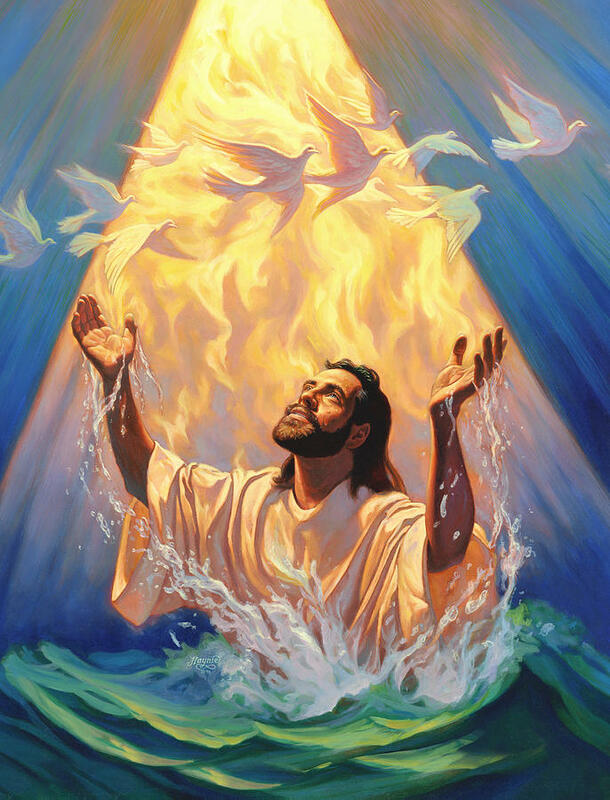 The baptism of Jesus at the Jordan may have been like that. The crowd of Judeans submitting themselves to John's immersion ritual may not have taken much notice of the Galilean in their midst. But all the evangelists, drawing on the hindsight of the Church's reflection, agree that this event at the Jordan was a profoundly significant moment—in the history of Israel, in the story of Jesus, and in the lives of his followers. Luke's two-verse account is packed with clues to the larger meanings of this inaugural event. First, Luke passes over the action of John. Luke simply says that after everyone, including Jesus, had been baptized, Jesus was praying. 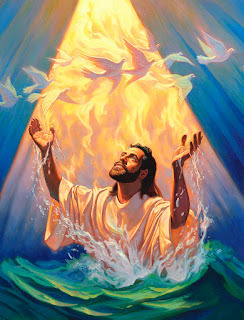 Already Luke has made two important interpretive moves: (1) Jesus is in the midst of “all the people,” thereby invoking an important theme in the Third Gospel, Jesus' solidarity with the people of Israel; (2) Jesus' being at prayer prepares us for the other times in Luke and Acts when prayer and empowerment by the Holy Spirit are linked—in the instruction on prayer (Lk 11:13), the choosing of the Twelve (Lk 6:12 with Acts 1:2), and Pentecost (Acts 1-2). Text Box: The emergence of Jesus into his public ministry is announced in language that already hints the end of that life on Calvary.When he speaks of the descent of the Holy Spirit upon Jesus, Luke is careful to add the phrase “in bodily form” because the attentive reader of his gospel will remember that Jesus was already announced as conceived by the Holy Spirit (Lk 1:35); and so this experience of the Holy Spirit is not something unprecedented in Jesus' life but a fresh manifestation of a relationship already established. As for the statement of the divine voice from heaven, Luke leaves Mark's version untouched, for it carries a fullness that cannot be improved. “You are my beloved Son” bears a double resonance. First, it evokes the heavenly voice quoted in Psalm 2:7 announcing the accession of a divinely appointed king, therefore a messianic sonship. Second, the phrase “beloved son” recalls to Jewish ears the famous place in the Torah where that phrase occurs as a kind of refrain (three times, in Gen 22:2, 12, and 16). This is the Akedah, the Binding of Isaac. Thus the emergence of Jesus into his public ministry is announced in language that already hints the end of that life on Calvary. Finally, “with you I am well pleased” echoes Isaiah 42:1, the beginning of the first Servant Song of Isaiah, this Sunday's First Reading. That simple phrase, then, recalls the whole mission sketched by that song: bringing forth justice to the nations with the gentleness that refrains from breaking the bruised reed, bringing light to the blind and freeing prisoners. Thus in two short verses inspired hindsight presents the emergence of Jesus into his public life in a way that shows him to be Messiah of Israel, Son of God, and Prophet to the nations. The Old Testament background clarifies why the Church sees our own baptism as an immersion into that same mission.